What is Community Life Forward??? 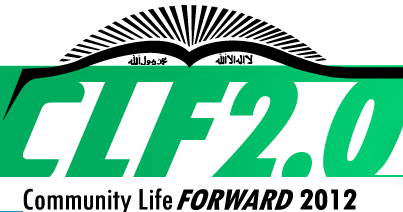 Initiated in 2010, Community Life Forward (CLF) is an action-oriented national conference planned annually by an all-volunteer team from across the United States. The team consists of a diverse group of Muslim American artists, community leaders, educators, engineers, entrepreneurs, historians, homemakers, scientists, students, and more. As students of Imam W.D. Mohammed (RA) we are devoted to the best expression of community life, sharing our common bonds of human interest in cooperation with people from diverse backgrounds. CLF identifies, provides a platform to share, and an opportunity for interaction for those foremost and interested in implementing good works for the betterment of human interests across racial, religious, and cultural divides. 8. Engage fully all members of our community, including children, youth, young adults, and elders.